“Central Processing Unit” is the full form of CPU. The brain & heart of any computer is CPU. It is a processor often called microprocessor. It is the central processor that makes comparisons, performance, calculation, reading, interpreting & controlling the execution of the instruction. The full form of ALU is Arithmetic Logic Unit. This unit process every accepted data by using two methods, one is – Making Mathematical calculation & another is Making a Logical decision. Basic Arithmetic operation. Such as- add, subtract, product, division etc. Logical operation. Such as- and, or, not, nor, and etc. 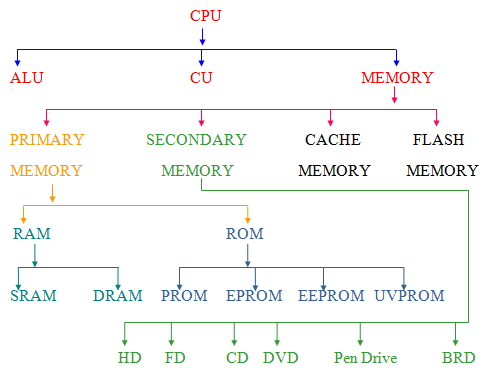 Memory operation. Such as- store, read etc. Program sequence control operation. Such as- jump. Sending the information to required path. As the name implies the “Control Unit” is to control and monitor all the activities of a computer. It is controlled and communicated with ALU, Memory Unit and Input-Output Unit. Obtaining information from one or more sources. Like- keyboard, mouse, scanner etc. Presenting the data and instruction to the appropriate device for processing. Presenting the processed data to appropriate device.